If you are interested in our horse assisted team leadership training, you probably also want to know the expected results and ROI for your time and money invested. So let's have a look at some of the results you can expect from the horse assisted corporate seminars which I offer in the UAE. These corporate and personal development seminars are really not about horses. The horses are simply used to get people connected to themselves and to start looking inwards. Change can only happen if I am willing to change and if I know what I want to change and why. Self-reflection is one of the most important aspects of the seminars. And the horses have a beautiful, non-intrusive way of getting people to think about their own actions and intentions, without offending anyone or without any accusations. Other benefits related to an equine leadership seminar include stress-relief, more self-confidence, clarity and, of course, fun! Being aware of ourselves and of how we come across to others is another very important pre-requisite for change. There are so many things we do unconciously, sometimes hindering our progress and success. By becoming aware of these patterns, we are able to change them! Team building is certainly a very important result and outcome of spending a day with the horses. As the day is action-packed, and everyone is asked to join in, there is no passive viewer. Many of the exercises rely on the entire team working cohesively, and again, the horse will clearly show when the team is not working as one. The immediate feedback, with the chance to change and try again, and the positive results of this will strengthen communciation, bond, understanding and team spirit among the colleagues. Communication happens on several levels: Spoken and unspoken communication. As we cannot communicate in our spoken language with the horses, our intuitive body language and intentions are extremely important during the sessions. We learn to give clear instructions, to say what we want and to make ourselves understood to others. Especially for people who come to these equine seminars without any prior horse experience (and that is the majority), getting in close contact with these majestic animals can seem daunting in the beginning. Safety is our highest priority though, and as the participants get more and more secure throughout the day, they experience that with a little bit of trust and self-confindence, they are able to achieve a lot more than they thought they can. Every individual, but also the team as a whole, will leave from the course full of motivation and self-confidence. There is no right or wrong - everyone needs to, and will, find their own way to go through the exercises, and everyone takes back the learning that is important to him or her in that moment. Which values are important in your organization? Discuss with us prior to booking what you are looking to get out of the team leadership training or personal development seminar so we can customize the approach for the day. It is not surprising though that a day with the horses brings out new topics which may have been buried under the surface, and the values that preceed in your organization will become clearer. Which values are important for your team members? How much do I tolerate, what is important to me, and how do I want others to treat me? These are questions which the horses forces you to answer - before leading someone else, you first have to be very clear about yourself, be clear about what is important to you and where you want to go in your life. What are the results for your company? Over and over again it has shown that a team leadership training with horses results in more team efficiency and better communication back at the workplace. Happier, motivated team players return back to the office and are able to motivate not only themselves, but others around them too. Colleagues start to notice each other differently. Burn-out and other stress symptoms can be reduced. Not only do you achieve fast results for your people - they are also long lasting. Because the experiences made during the day are stored in the emotional system, these feelings can be called upon in any other situation, and are often remembered for many years to come. 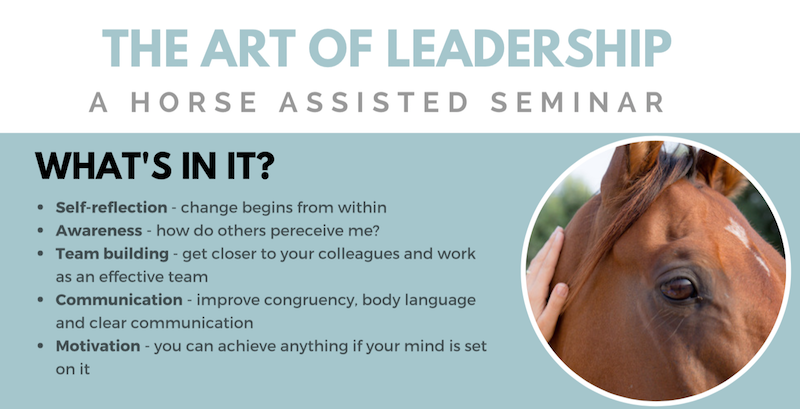 This makes an equine based leadership course so much more efficient than any classroom based seminar. To book a team leadership training for your company, inquire now about the details. The courses run in Abu Dhabi (year round) and Dubai (only winter months) and can always be customized depending on your companies' goals.